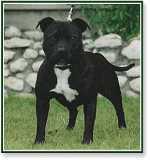 Toys for your Pit Bull provide two important roles for your Pit Bull puppy. The first role is to help stimulate your dog both physically and mentally. The second is to prevent him from tearing down your home. Your Pit Bull, or any dog for that matter, will make it less likely they will destroy items in your house if given their own toys that they can play with. Toys for your Pit Bull that they will love playing with are balls, especially big, colorful bouncing balls. They also enjoy a large and partially deflated ball. Hard rubber balls are good for tough-playing puppies. Avoid using small balls such as jack balls or golf balls because dogs tend to inhale or swallow them. Soft rubber balls are also not recommended because they can easily be chewed to small pieces and then swallowed. Other toys for your Pit Bull include fleece toys, although some dogs tend to be too rough with them and rip them into shreds. Keep in mind that fleece toys are not chew toys and your dog should not be allowed to play with them while you are not around to supervise, or your Pit Bull might chew it up and swallow the material. Other Toys for your Pit Bull also include Rubber tug toys and are among the favorites of the Pit Bull, although you may need to have constant supervision when your Pit Bull is playing with them, especially around kids. This kind of play may promote physical competitiveness that may not be appropriate for your Pit Bull. Use these toys sporadically and combine it with more moderate and gentler activities. Squeaky toys that are made of plastics are not a good choice of toys for your pet. These kinds of toys can be easily chewed and swallowed or the “squeaker” can be lodged and also swallowed. Never leave your dog unattended with a squeaky toy. Similar to fleece toys, squeaky toys are not chew toys and should only be used when you are playing with your dog. Another type of toy for your pet that they can enjoy is a pole lure. It is basically a stick that is about six feet long with a string of the same length tied to the end and a toy tied to the end of the string. The goal of playing this toy is for you to run around while dragging the toy and trying to keep your dog from catching it. Avoid letting your dog get hurt by jumping too erratically after the toy. If a pole lure is not available, your dog will be just as happy settling for a good old-fashioned stick. Just make sure that the ends are not sharp and that it is long enough for him to be able to jab one end to the ground while holding the other end in its mouth.